The citrus and ginger combination kick up the taste in this dish of Salmon Fillets with Mandarin and Ginger from the wonderful cookbook Citrus by Catherine Phipps. If you can’t lay your hands on mandarins I have used an orange or tangerine as a substitute. And if you don’t have pomegranate molasses in the cupboard substitute a tablespoon each of rice vinegar, soy sauce and mirin. I like serving this over a bed of couscous with chopped parsley, pistachios and pomegranate seeds. It’s bright flavors and pleasing colors are especially welcome in the depths of winter. Once you have tried this you can easily substitute ingredients and flavors while keeping the citrus/vinegar balance. Step 1 Rub the salmon fillets with the mandarin and lemon zest, cardamom, ginger, salt and pepper. Set aside while you proceed with the recipe. Step 2 Heat the oil in a large frying pan on medium heat. Add the onions and saute for several minutes until soft and translucent. Add the garlic and cook for a few more minutes. Push everything to one side and add the salmon fillets. Cook for 4 minutes. Turn the fillets over and pour over the mandarin and lemon juices along with the pomegranate molasses. Simmer for 2 minutes, then turn the fillets again for an additional 2 minutes. Remove to a warmed plate. Step 3 Stir the onion and garlic into the sauce and cook until syrupy – another minute or two. 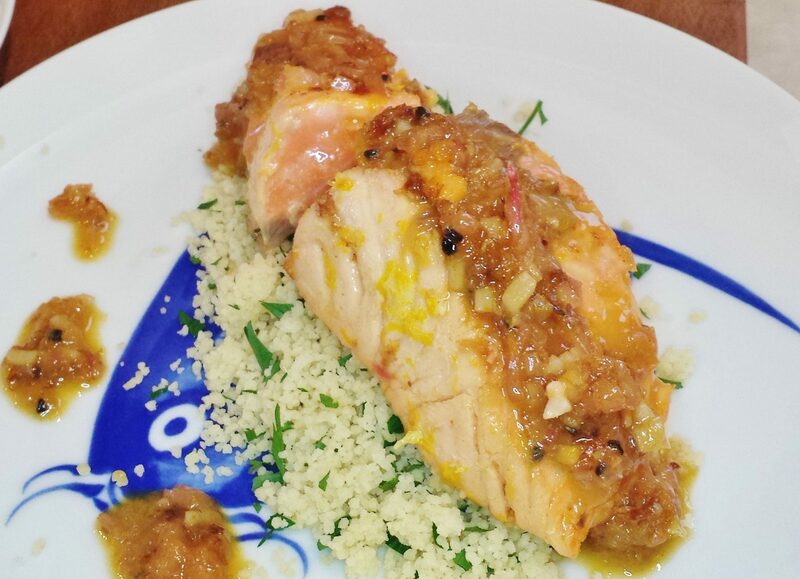 Step 4 Place the couscous on the plate, place a salmon fillet on top and dress with the syrupy sauce. This recipe is very easy to shop and to cook. It took me only about 20 minutes and I am really surprised by how the taste of salmon turned out… the idea of soaking the fish meat with freshly grated lemon and mandarin is ingenious. However, I made one modification. Since I was not able to get mandarin at this time in the UK, I used tangerine but the result is equally brilliant. (at least I hope it is as good as using mandarin). Many thanks, Joan and Adrienne. So glad that you and your husband enjoyed the Salmon! It is one of my favorite ways to cook salmon and as you noted, substitutions can easily be made depending on what is available in the market.